Happy last day of National Ice Cream Month! Wow...made our final post in the final hours of the last day of National Ice Cream month. It's been an awesome month posting daily and I think we both have to admit it's a lot of work but in the end so much awesome stuff to share and we too learn lots along the way and eat way too much ice cream. BUT summer's not over yet and there's definitely more to come including an awesome giveaway so stay tuned! Happy 402nd Post to Us! (↑) Above, 400 ice cream cones for 400 posts! We missed it! A couple of days ago, while posting about liquid nitrogen ice cream, I should have been patting us on the back for our four hundredth post! How exciting! I guess we'll have to celebrate number 402 today! We have loved blogging and interacting with all of our readers. Even though it is a lot of work, I especially love doing a post-a-day during July, National Ice Cream Month. We have more exciting interviews and recipes to come, so stay tuned and thanks for reading, responding and interacting with us! I wrote about The Ultimate Frozen Dessert book a week or so ago. I mentioned I made the raspberry gelato, only I used black raspberries and upped the amount of berries from two to three cups. 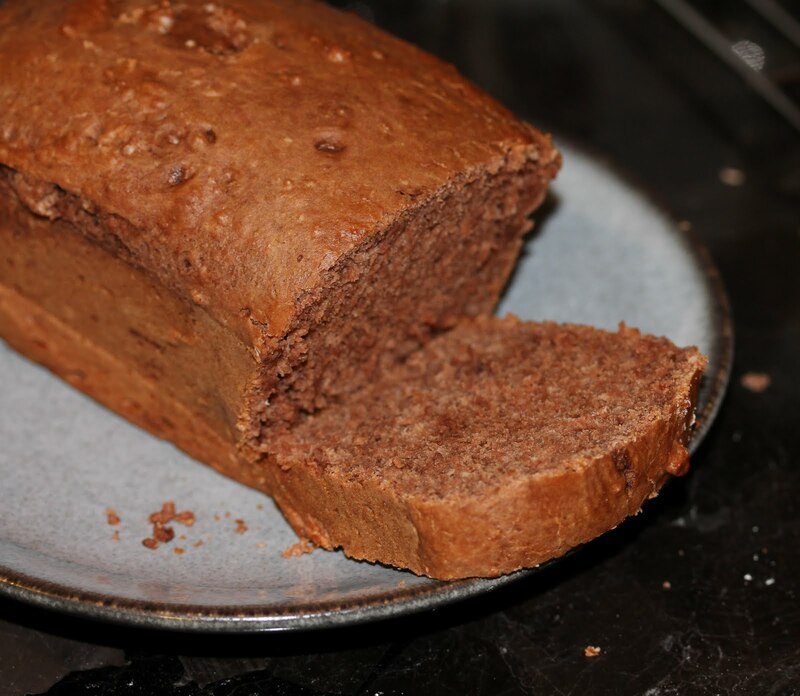 I made it a couple of weeks ago and hadn't tried it since it ripened (hardened). I was making the gelato for my annual ice cream party. As a rule, I make the ice creams/gelatos/sorbets in advance of the party and don't taste them again until the party. However, my dear friend Lisa was visiting from Colorado and she wanted a tasting since she is never around for the party, so I let her, as long as we didn't leave much of a mark. We tried a few of the flavors and I asked her what her favorite was...black raspberry gelato. As I had tasted it too, I had to agree that it was pretty darn good. So then I did the unthinkable (especially since I still have tons of ice cream to make for the party) -- I suggested we each have a dish of it. But first, I had to call my parents to see if they had more berries for me to take from them, so I could remake the gelato for the party. Thanks to my parents for looking in the freezer to check -- they do have another quart! So...Lisa and I dug in. This gelato is not only gorgeous but it is amazing. It's rich and sweet, while at the same time being light and refreshing, if that is possible. I do suggest you try it. Husband, if you are reading this, I know you will want to be in charge of the actual "Let's Try It!" post, which means that all of our lucky readers will get to see how liquid nitrogen ice cream turns out for Scoopalicious. Readers, stay tuned for our own experiences sometime in the future. That looks like so much fun! And mixing and churning in under 5 minutes?! Awesome! Thanks for sharing, Dr. Sanford! So Husband, get your cryogenic transfer container so we can get our liquid nitrogen and get this ice cream churning! Unfortunately I never got a good picture of the "small" that showed the true size -- remember in the last post I was just fighting to keep the ice cream on the cone and out of my lap. In the name of science, Kevin decided to fork over the $3.95 and get the large -- what a sport. At right, you can see what we got back with our nickel when we handed over four dollars. The large looked to be about a pint of ice cream and weighed in on the postage scale at over a pound. So I lied. I said "If-This-Is-A-Small-I-Don't-Want-To-Know-How-Big-The-Large-Is," but truth be told, I did. I wanted to know. And now we do. We've posted about this topic in the past but none have had a fun Infographic for this same important question. In honor of National Ice Cream Month, Ultimate Coupons created this fun graphic based on "what does your favorite ice cream flavor say about your personality?" and we thought it'd be fun to share. Funny according to this chart I am a "romantic" (mint chocolate chip) and my husband is a "wildcard" (Rum Raisin). I was amused by his chuckle at that one. Must admit it's the other way around but still fun none the less. As Ultimate Coupons says, it's as accurate as reading your daily horoscope, but lots of fun to read. Check out what your favorite flavor says about you." Someone once suggested I make grape ice cream. I did some research but was hard pressed to find recipes. I read somewhere that the reason it's hard to find good recipes is that natural grape, when used in recipes, isn't so much a flavor as a sweetener. It kind of makes sense, seeing as a lot of recipes that avoid sugar use grape juice as a sweetener. I did try to make grape ice cream -- though I don't recall it very well -- which goes to saying that it wasn't that memorable -- I think I used grape juice concentrate and it came out very mildly flavored and pretty sweet. When I came across a recipe in The Complete Idiot's Guide to Homemade Ice Cream for grape ice cream, I had to try it. I had to remember to half the recipe, since the recipes are always at least two times the amount that will fit in my ice cream maker. I don't know if I messed up on the conversion or the translation of tablespoons of gelatin to packets of gelatin, but the ice cream didn't work out. Go me, failing at a recipe in a complete idiot's guide! I hate throwing stuff away, but this ice cream was too "chewy" and chunky -- it actually had clumps of gelatin in it! In fact, when I took it out of the bowl to put it into the ice cream machine, it was actually pretty solid -- kind of like a grape mouse. Either way, I'll have to try this one again. Or should I? Have I not learned my lesson about gelatin and ice cream? Anyone who reads this somewhat regularly knows I am a huge fan of Bruce Weinstein's book, The Ultimate Ice Cream Book . It's my go-to ice cream making book, my bible of ice cream making, the only book I have ever had to have rebound from so much use. Last year, after finding out on their Harper Collins bio that Bruce Weinstein and co-author Mark Scarbrough live in the small county in Connecticut where my mother grew up, I emailed them just to say hi and let them know what a big fan I am. Mark wrote back suggested I try out The Ultimate Frozen Dessert Book , which does not disappoint. 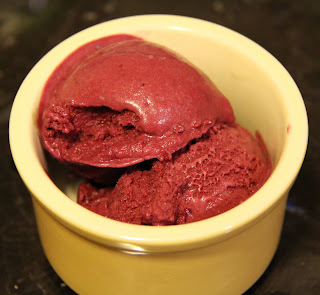 I haven't yet made too many flavors, but wow, I was blown away by their raspberry gelato recipe -- though I actually used black raspberries and admittedly a few more than the two cups the recipe called for (I told you before, my parents had an overwhelming crop of both black and red raspberries this year!) -- It was amazing. I would gladly take all of my parents raspberries and make pint after pint of this gelato. I have also tried the marscapone gelato recipe, which was also very good, but I found myself a little disappointed since I was trying in vain to reproduce Perry's cannoli ice cream, which I still can't buy around Boston. The Ultimate Frozen Dessert marscapone gelato was very good though -- I was just hoping it would be a magical reproduction of the flavor I so desperately love. I can't wait to make more recipes from their book. I honestly don't know why it took me so long to add it to my library. Thanks again, Bruce and Mark...we love building our Ultimate collection (we have The Ultimate Peanut Butter Book , too) and I also have plans to get my sister your knitting book soon, too. A perfect treat on a 100 degree New England, or anywhere, day! 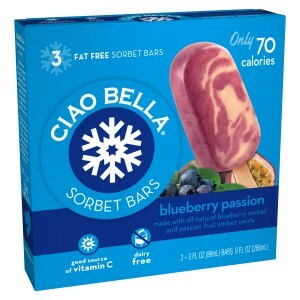 Ciao Bella does it again with their Blueberry Passion Sorbet pops. Somewhat tart and super refreshing. 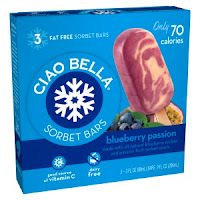 I was very psyched to have these in the freezer yesterday when it hit 103 degrees. What's even better is that I felt no guilt eating it. It's simple... all natural Blueberry sorbet swirled with all natural Passion Fruit sorbet. 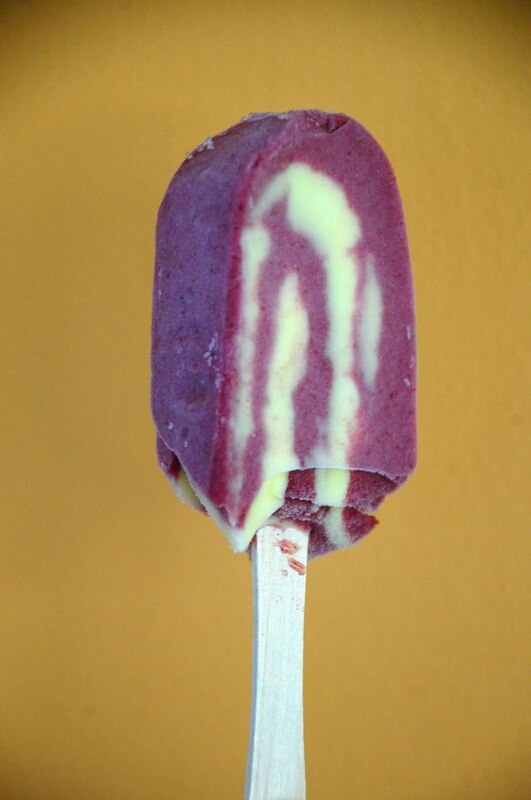 Love it and it was honored with Self Magazine's "Best Fruit Pop" award in their 3rd annual Healthy Food Awards lists being dairy and fat free and a lonely 70 calories. Love it even more! The photo of my bar is a little sad because they didn't survive the heat all that well, or the delivery (thanks Ciao Bella for sharing with us!) so it's actually missing part of the bar along the bottom (see pic of it on box below...much bigger) but I had to share what's inside the box because these are super good and look yummy too. There are 3 to a box and definitely a decent size. Happy Vanilla Ice Cream Day! The most popular flavor of ice cream in the United States is said to be vanilla. Honestly, it's not what I ever choose first when there is a big list of choices, but it is familiar and simple and at the same time it's the only flavor I will ever have in a sundae. I'd have to say my two favorite vanilla ice creams are the now non-existent Brigham's French Vanilla and Carvel Vanilla (but this might not even count since 1. It has to be covered in rainbow sprinkles and 2. It might just be for sentimental reasons). I do recall once having an amazing vanilla gelato at Papa Razzi years (maybe 15 or so years) ago, but this could be a glorified memory and/or maybe it was a one time thing. I don't know enough to really count it among my favorites. Above all, it's not that I don't like vanilla, or even that I haven't enjoyed the vanilla that I have had -- the thing is, I just don't think I have been blown away by any vanilla -- there aren't many vanilla's (see exceptions above) that really stand out and make me want to order vanilla above all other flavors. I want to know what you think. 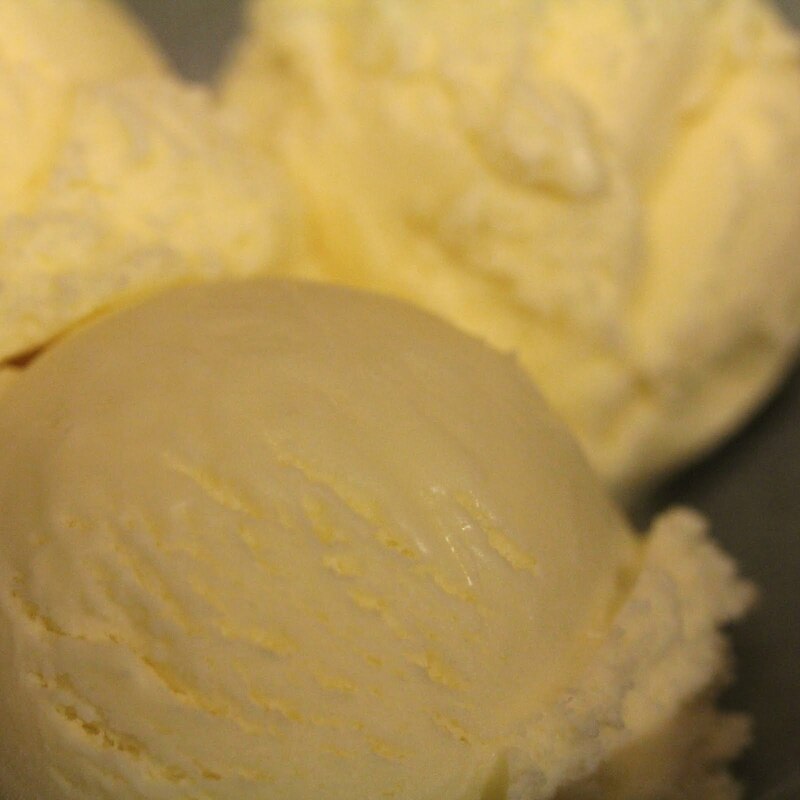 What's the best vanilla ice cream you've ever had? Was it in a carton? Homemade? At a stand? At a shop? Was it french vanilla? Did it have specks of vanilla bean? Please do tell! A month or so ago I got Jeni's Splendid Ice Creams at Home . I have never had Jeni's but have heard some really good things about it. I think the first time I heard about it was from my dear friend Pam, who at the time lived on the same block as one of Jeni's locations in Columbus, Ohio. (Coincidentally, Pam now lives five minutes away from Tina -- even though they don't know each other). When purchasing Jeni's book, I don't think I knew what I was in for -- there are some very unique and daring flavors! I decided to try out her Riesling Poached Pear Sorbet. I didn't know at the time, but this is one of her signature flavors, so it was a good one to start with. Um, it may be a good one to finish with. I may never make another recipe from that book since now I am addicted to the sorbet and I want to make it all the time. My husband thinks it is too sweet, but to me, it's perfection. I am not a big drinker, but I do love my Riesling. And lately, when making baby food, I always steal some of Violet's cooked pears. I love cooked fruit, but I particularly love cooked pears. (On an unrelated note, here's another great recipe for poached pears.) Anyway, the Riesling and cooked pears is a perfect combo to me. Since I hate taking out my food processor , I put the mixture through the food mill instead. I don't think this made a difference, especially since you then push the mixture through a sieve. Another thing I dislike is peeling pears. I wonder if I really needed to do this. I mean, first of all, I wonder if the specs of pear skin (especially if you used a red pear) would look kind of pretty -- that is, if they even made it into the final stage -- I kind of feel like the pear skin would have been strained out when the mixture was pushed through the sieve anyway. Next time, I'm skipping the peeling part...unless you completely disagree, Jeni. Jeni, I'm a fan. Please open up a shop in Boston. Thank you! As I've mentioned before I am a working mom and by day I am an art director at a big corporation. Well one event we have that I actually do look forward to is our company summer outing. I know, who really gets excited about company outings. 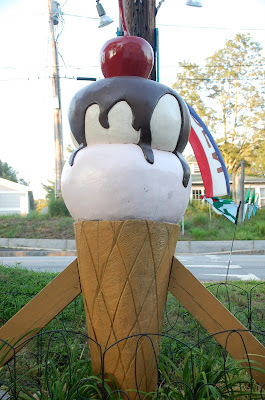 Well I do for this one because it's at a Kimball Farm in Westford, Massachusetts where since 1939 the scoops are huuuuge and at our private event the scoops are endless. Even better! Although I hate to look like a glutton in front of my coworkers so I do exercise restraint. This is how it goes...we do our company games where someone inevitably gets hurt in a mean game of tug-o-war, then we eat a good old BBQ picnic lunch and then the rolly carts loaded with ice cream comes out and two fun and friendly teens with awesome summer jobs of scooping ice cream all summer serve us their to-die-for ice cream. And we can go back as many times as we'd like. Unfortunately they can't fit all 40 flavor in these carts so our choices are limited but we have some great options. 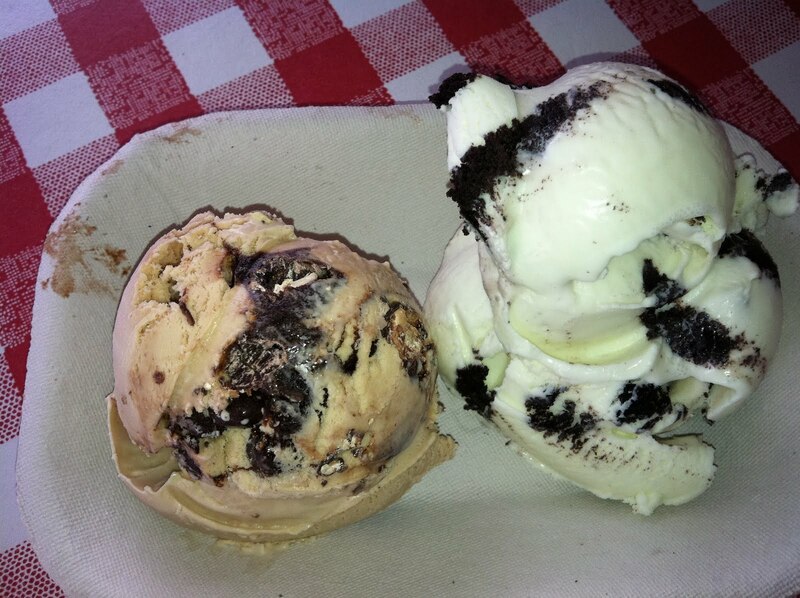 My first picks: Mocha Almond Fudge and Mint Oreo (pictured below). There is something about Mint ice cream that isn't green. I know it doesn't alter the taste but the natural aspect of it is so refreshing. As I've said before Mint is my favorite and this was great. The Mocha Almond Fudge was well, exactly that with just enough almonds and fudge not to take over the taste of the mocha ice cream. Well both flavors did not disappoint. My partner in crime on the 3-par course chose good old Chocolate and Kahlua Crunch as pictured on the top. I couldn't go back for seconds but I did taste test his. The chocolate is sooooo good. Oh I forgot to mention we also get fudge, marshmallow, caramel, sprinkles, and this keg of whipped cream that I wanted to take home but I couldn't get away with it. I did have to dip into the fudge a little. If you've never been to Kimball Farm is is worth the trip. It not only has awesome ice cream but really is an event with all the activities it has to offer. It's an awesome place to take a family, friends, or date night for mini golf, bumper boats, friend foods, batting cages and more. I do wish I lived closer but it's probably a good thing that I don't! When I was younger, I don't think I appreciated the raspberries we had, in all their varied presentations. We had raspberry shortcake, crisp, muffins...yes, it did feel a bit like Forrest Gump, except with raspberries. In all seriousness though, living two hours away from where I grew up, I realize what a special thing these raspberry plants (and my parents) are! What brings me home during the summer, even when I can't be in the same state as my parents, is the common summer treat of vanilla ice cream with sugared raspberries (to bring out the juices). To me, there is nothing that says summer more than this. Which state consumes the most ice cream? This is the question I found myself in the middle of during a lunchtime debate and of course the group looks to me as the expert and this time I came up empty-handed so I had to look it up. Everyone's guess around the table was Massachusetts. Well maybe we're a little biased seeing as that is where everyone guessing was from and all they can recall are New England summers and ice cream. What's a summer here without it? Then we thought well maybe it's one of the warmest states? Or is it a state known for having lots of dairy farms? I thought it was Alaska, as noted by Turkey Hill back on 2008, but trends may have changed because it seems like the Northern Central States keep coming up in my searches as the most ice cream consumed per capita. 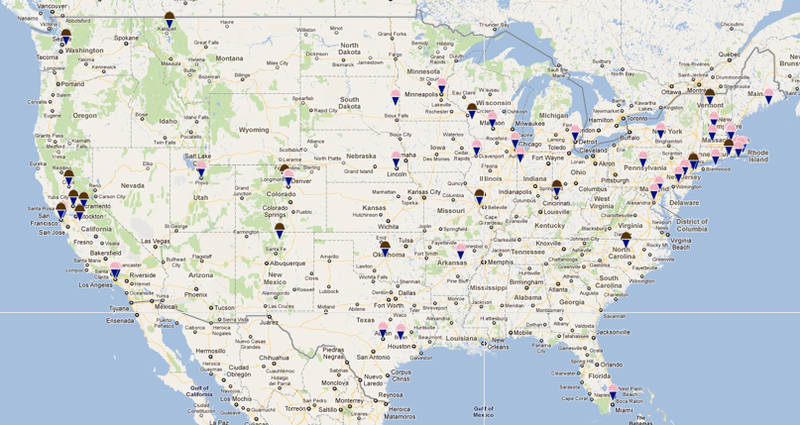 Unfortunately no specific state has been targeted but that narrows it down a little bit at least. My lunchtime crew is going to be disappointed. 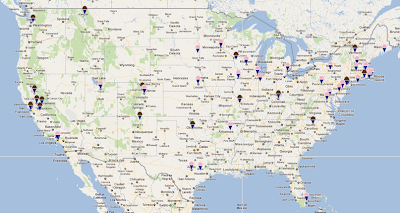 I wish I could say Boston is at the top of the list of cities with the most ice cream consumption but Portland, Ore., St Louis, MO, and Seattle, WA come out on top. Oh well this just gives us more reason to eat more ice cream to come out on top next year. Interview with New York's MilkMaid, Owner of MilkMade! The other day my husband sent me this link. 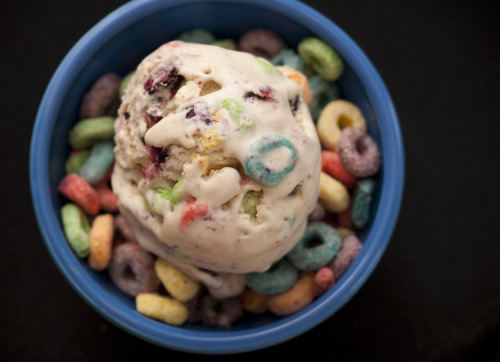 Froot Loop Ice Cream?! Lucky Charms Ice Cream?! Why didn't I think of it and how can I get some? Upon further looking, I found that this was the creation of MilkMade, a small batch ice cream company out of New York. Immediately I pondered the move to New York, just so I could subscribe to their hand-delivered ice cream service. Unfortunately, right now moving to New York for ice cream just isn't feasible, so second best was getting in touch with the the MilkMaid herself and learning a bit about MilkMade. The MilkMade: I'm Diana, the founder of MilkMade Ice Cream. Scoopalicious: What were you doing before you started MilkMade? The MilkMaid: Prior to launching the business I was working as a biz dev consultant for small businesses in NY, and had just received my MBA from NYU Stern. Scoopalicious: How did you start MilkMade? The MilkMaid: One summer I decided to start making ice cream. I wasn't satisfied with my local pint offerings -- I want a natural product made with local ingredients with unique and sophisticated flavors. I decided I could just make that for myself, so I bought a machine and started crafting 'scream. I began serving to friends, serving at parties, and found that I wasn't the only one seeking a better pint. So I launched MilkMade and have been sharing my creations with New Yorkers ever since. You can read a bit more about how we got started on our website and in some of our latest press. Scoopalicious: You source local ingredients -- AWESOME -- since I am assuming there aren't any cows in Brooklyn, how what area defines your "local"? The MilkMaid: Yes, all of our ingredients are as local as possible. Our dairy is from a farm in Ancramdale, NY, about 100 miles upstate, and all of our mix-ins are sourced from the best local artisan producers in New York and Brooklyn. 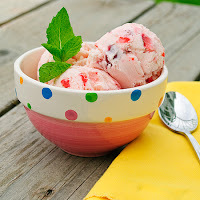 Scoopalicious: How did you learn to make ice cream? The MilkMaid: I bought a little Cuisinart machine and taught myself. After many trials, I created the right base recipe for MilkMade and I always manipulate that recipe based on what mix-in or flavor add I'm using. Scoopalicious: Adorable logo. Who designed it? The MilkMaid: The logo is the result of a gchat conversation between some MilkMade friends. Instead of a heart, <3, we double scooped, ,<00, and thought it would serve as a perfect logo. We'll know we've made it when Google turns it right side up. Scoopalicious: (That would be awesome if Google turned it right side up! We'd love that too!) What is your favorite flavor among your creations? The MilkMaid: After crafting almost every new flavor, I declare it my favorite. Recent favorites have been Strawberry Shortcake and S'Mores. Scoopalicious: Before MilkMade, what was your go-to ice cream? The MilkMaid: I started MilkMade because my go to ice creams weren't cutting it anymore for me. My palate had become a bit more sophisticated, I wanted a natural product, and I wanted something locally produced. Nothing quite met that, so I decided to do it myself. 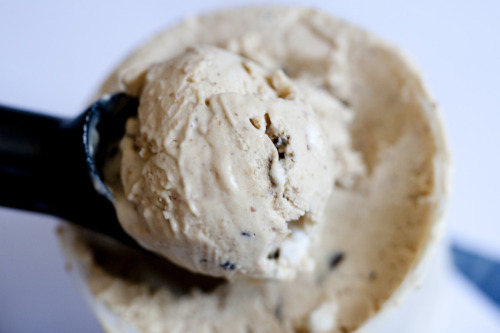 Scoopalicious: Any ice cream making advice for our readers? Scoopalicious: Is it still just you in a kitchen with a single ice cream maker? Do you have help? The MilkMaid: I still craft and produce every pint myself in a commercial kitchen. We have some help in the form of friends and interns, and we're hoping to bring some full time help on soon. Scoopalicious: I notice on your blog you have a flavor a day. How many of these flavors make it past your palette to the customers? The MilkMaid: The flavors of the day are typically trial flavors for future flavors of the month, flavors for friends or events, or just fun experiments for me. Quite often something makes me go WOAH and I change the planned flavor offerings around to fit it in for our members. Scoopalicious: Do customers get any say in what is delivered? For example, can someone with allergies sign up for your service or would they potentially end up with ice creams they can't eat? Additionally, could a customer request something from your blog for their next delivery? The MilkMaid: We make two flavors every month and announce them to our members about a week before delivery. Members have a choice of which flavor they'd like to order. We always take suggestions, and as you can imagine, people are always willing to suggest an ice cream flavor. if a member has an allergy, we allow them to defer their pint that month and extend the membership a month. Scoopalicious: Who are your "testers"? Are you hiring any testers? The MilkMaid: Ha, we don't need to 'hire' any testers, as we have a long and growing list of volunteers. My main testers are my boyfriend, my roommate, and really, anyone who drops by my apartment/test kitchen. I'll often pull out 5 different iterations of the same flavor and ask people to rank them. Scoopalicious: Do you have plans to expand? Mail order? Local shops? The MilkMaid: Yep! But we'll always keep it real and hand-craft each and every pint. Watch as the MilkMaid visits the Rachel Ray Show! Thanks so much to the MilkMaid for such a fabulous interview! Photos and logo © MilkMade. Two ways to celebrate....eat or make ice cream! Nothing says summer like ice cream and nothing says summer like strawberries. And here you get both! In a small bowl, combine 1/3 cup sugar, strawberries, and lemon juice; gently stir. Allow the strawberry macerate for 1 to 2 hours. In a medium bowl, mix together milk and remaining sugar with a hand mixer or, about 1 to 2 minutes until sugar is dissolved. Stir in heavy cream, vanilla, and juice from strawberries. 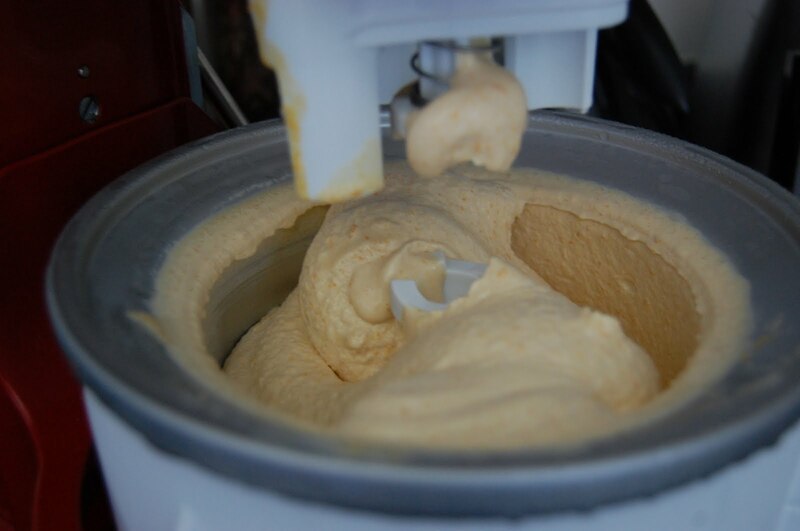 Pour mixture into the bowl of an ice cream mixer and turn on the machine. In the Cuisinart, it took about 25 to 30 minutes to thicken. In the last 5 minutes pour in strawberries. If desired, place ice cream in freezer about 1-2 hours before serving to allow ice cream to ripen. Yields 1 1/2 quarts. Back in February I posted about ice cream bread. It's now July and you probably want to be eating ice cream, not turning on the oven and making bread with it -- well, you can file this one for later. Using Friendly's Fudge Berry Swirl Frozen Yogurt. (I wanted to use Cherry Garcia*, but the store didn't have any, so I tried something somewhat similar.) I tried the recipe as is (equal parts ice cream and self rising flour) but I found it a bit dense -- more like a scone. I thought maybe it was the frozen yogurt that made it dense, but it looks like even the photos on the original post came out very scone-y looking. I decided I wanted to try something a bit different the next time I made it. Using the same frozen yogurt I had used to make the scone-y ice cream bread, I tried again and made it this time with 4 parts melted ice cream (um, in my case, frozen yogurt) and 3 parts self-rising flour , baked it at 350° for about 30 minutes as suggested...much better. It rose better and was much moister. So easy peasy. Just to reiterate...Preheat oven to 350°. Mix together 4 parts melted ice cream with 3 parts self-rising flour. Add add-ins if desired (see below). Place in a greased bread pan. Bake for 30 minutes (or until the toothpick inserted in center comes out clean). Thanks for the easy and yummy recipe, Bindlestiff. *On an unrelated note, while I was looking to link to Cherry Garcia, I am came across these yummy looking cupcakes. Just when I thought Key Lime Graham Gelato couldn't get any better Ciao Bella goes and makes it into a cute and tasty gelato square. As you may have read in the past, this is one of my all time favorites (free samples or no free samples) and I was genuinely super excited to try these new squares that were sent our way. Although I still prefer eating the gelato straight up out of the pint these are quite good. And are perfect for on the go or perfect when I only have one hand available...thus life with children. Same tart and refreshing taste but sandwiched between two soft wafer grahams. This has been a very humid and hot New England week so these were the perfect after dinner dessert this week. Now as you can see a little one in my household can't wait for mommy to take a photo of it for this post. I held him off briefly. So I could take a couple bites myself to see how awesome these are. But in the end I lost! Thankfully there are four squares in a box so I have three more for just me. My daughter Violet is 11 months old now. I say this because before she was born we got a gift certificate in the mail to hold an ice cream social at SONIC. Violet being my first baby, summer came and went, but we never made it to Sonic. 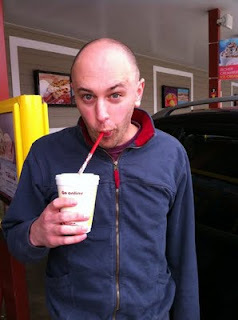 Fall came, and in October I gathered my husband, Violet, and six dear friends, and we headed to Sonic. It was our first time to SONIC and I was under the impression that in addition to the car service, there was also a seating area. I was wrong, and felt badly for having dragged my friends to an outing that had us sitting in two separate cars while we enjoyed ice cream, which is partially why I saved this post until the spring when the weather would be more promising for an outdoor gathering between the cars. However, what a great group I was with. There were four adults (Claudia, Yenny, Kevin, and me), one teenager (Veronica), three kids (Rebecca/8, Alex/6, and Sammy/5) and one baby (Violet) -- all girls except for Kevin (He loved it. The girls love him!). We parked next to one another, and I climbed out of our car and into the car with Yenny, Rebecca, Alex, and Sam) and Claudia and Veronica joined Kevin and Violet. We placed our orders, the girls (and I) watched excitedly as our food was delivered by carhops on roller skates and then we spent the next hour enjoying our frozen treats and scrambling between the two cars. The weather was a bit cold but we were still able to enjoy the experience nonetheless. Kevin enjoys his SONIC shake. The ice cream was good and though I think they only had vanilla soft serve, they offered it in a variety of ways -- with mix ins or syrups, in a shake or in a soda. The girls in the car with me ordered solely ice cream treats, but the gang in the other car also ordered food as well. When I asked Kevin if the food was good, and he replied "yeah" in a tone usually reserved for "duh" -- as in, "yeah, Bethany, it was. I can't believe you need to ask." The ice cream was good, and the servings were huge. The "cups" (though they weren't really cups, but these funny containers) were so full it was hard to open them without making a mess. The weather is warm again, and Violet is older, so it's due time we planned another trip to SONIC! Yum! I was hanging out with my daughter and my dear friends from high school the other day, and mango ice cream came up. (Really, when does ice cream not make it's way into my conversations?) I said I really wasn't a fan. The friends said I had to try Reena's Mango Ice Cream. I was willing to give it a shot -- I mean, once upon a time I didn't even like mangoes, but now I really do! Today another friend and I went to the Waltham Indian Market on Moody Street and (hurrah!) they had Reena's. I have so much ice cream in my fridge as I stock up for the annual ice cream party, and I had also mixed up a batch of the Nutella ice cream Tina just posted about for my husband (this turned out to be amazing, by the way), so I really didn't have too much room to bring home more ice cream, so I picked up three single serves...two mango and one tutti frutti...there were a lot of other flavors I'd like to try, but I didn't even know where to begin -- I couldn't even tell what the flavors were from their pictures and unfamiliar names. Anyway, mango ice cream, I may have had a change of heart. Three years go I started making homemade ice cream and at the time I had no clue what I was doing. So of course I turned to the good old trust-worthy web and amazingly found barely any info. Interestingly that is how this blog started but today there is definitely lots of great insight and advice. At the time we figured there had to be others out there looking for tips on making ice cream so we said let's document our ice cream adventures and share it with others. We know we share many reviews and recipes but also want to make sure we share tips we pick up or learn ourselves along the way. So awhile back I found this great list of tips for making ice cream on Serious Eats that I found useful, some of which I had already discovered while making my own ice cream, specifically number 4 and 9. I live by covering my ice cream with plastic wrap to avoid to avoid ice crystals and then always, always go slow when tempering the egg yolks. I do have a couple tips of my own that I added to this great list. 1. The bowls of most ice cream makers take at least 24 hours to freeze. 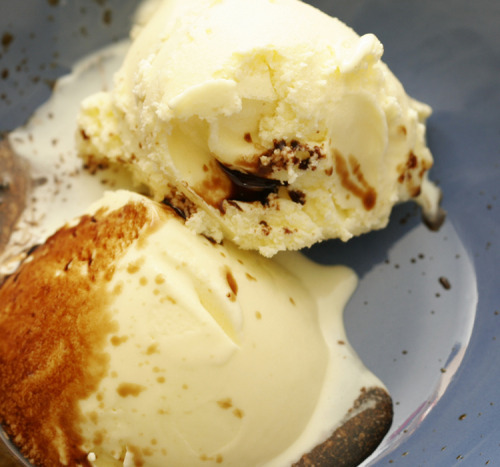 Get in the habit of storing the bowl of your ice cream maker in the freezer, wrapped tightly in a plastic bag. That way it's always ready to go. 2. The "batter" for your ice cream can never be too cold. I pour mine into an old quart-sized yogurt container and chill it in the fridge overnight. 3. Don't overfill your ice cream maker! Three-quarters full yields the best results. It might look a little empty, but trust me, if you fill the bowl up to the top, the ice cream won't aerate properly. 4. No matter what the recipe's instructions say, when tempering egg yolks for custard-based ice creams, never pour more than 3 or 4 tablespoons of hot cream into the yolks before whisking them back into the cream. And go very slowly. Nothing is worse then creating an accidental scramble. 5. As with drinking, when using alcohol as an ingredient in ice cream moderation is key. In my experience, anything more than 1/4 cup (in a recipe that yields 1 quart) interferes with the ice cream's ability to freeze. 6. Add extracts (vanilla, maple, almond, etc.) after the ice cream batter has cooled, but before churning, for the best flavor. 7. Add mix-ins, such as chocolate chips, nuts, and candy pieces, for only the last minute of churning. The ice cream should already be done. You just want to distribute the mix-ins evenly. 8. Shallow, flat containers are best for freezing and storing ice cream. While in America ice cream is usually sold in tall round containers, in Italy gelato is kept in low, rectangular ones, which promotes an even consistency. 9. To prevent ice crystals from forming, cover the surface with a layer of plastic wrap or wax paper before closing the container. 10. Homemade ice creams keep well for up to a week. After that, they begin to lose their flavor and creamy texture. Eat quickly—you can always make more! 11. Cool custard mix over an ice bath. This quickly stops the cooking process as to not overcook the custard base. 12. Invest in a set of nesting bowls. Each bowl has a use in the process and two are perfect for the ice bath process. And they store neatly too. My dear friend Nicole works in Newton. For the past few years we have been meeting pretty much weekly to go for a walk. Nicole is six months pregnant and keeps threatening to stop working when the baby is born. I am selfishly saddened by the fact that she won't be so close for our regular walks, and this was compounded when she took me to the new gelato place by her work. What?! We can't go for gelato weekly?! 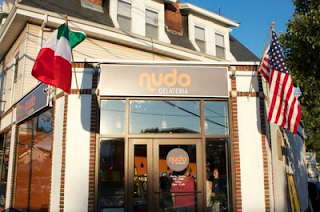 Nudo is a small shop on Watertown Street in Newton. It's a small shop that has a European feel to it as well as a charming, friendly staff with a great sense of humor. Oh, and did I mention that their gelato is really good? Nicole and I each ordered small raspberry blood orange gelato (I had still been deciding when she offered me a taste of hers and I was completely taken). It actually reminded me more of a very creamy sorbet, but who cared what it was or wasn't called? It was sweet, but incredibly refreshing -- perfect after our walk in the hot noontime sun. Nudo is definitely worth more visits. Nicole, you can leave your job to have that baby of yours, but let's make the most of the next four months and make lots of trips to Nudo! 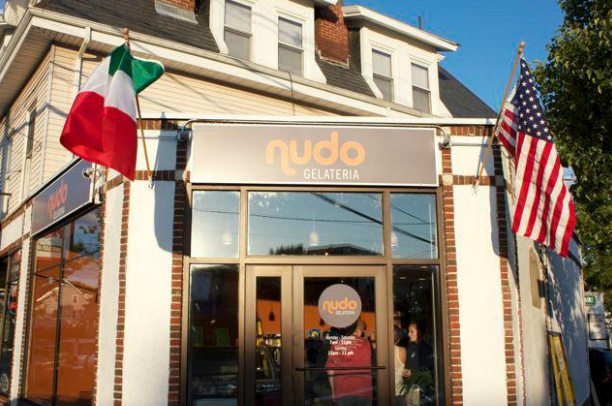 Photo of Nudo storefront from the Nudo website. Seems like times have changed in our house. 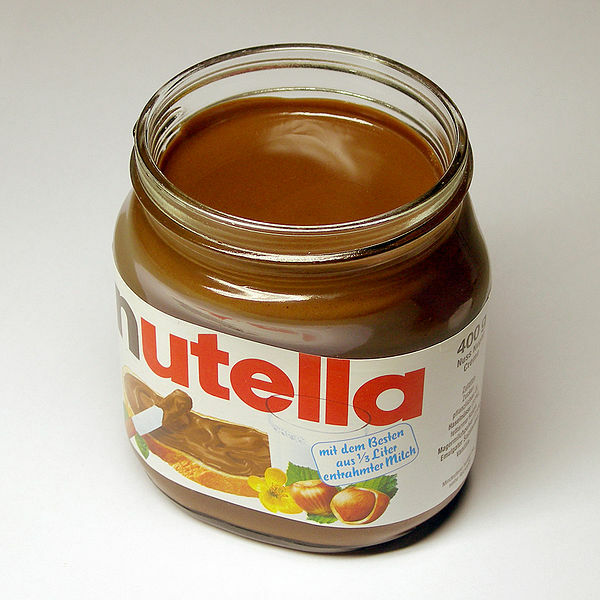 Once Peanut Butter was a staple but now it's Nutella, the european sensational chocolate hazelnut spread that is becoming popular here in the states. So what got it started was the whole "can't bring peanut butter to school" issues. Seriously where were the kids with peanut allergies when I was in school. But it's my understanding that Nutella is made from tree nuts and kids with allergies shouldn't have that either so hopefully this sticks around. I digress because this has nothing to do with ice cream but really it does link up here. I sadly haven't made much ice cream these days. 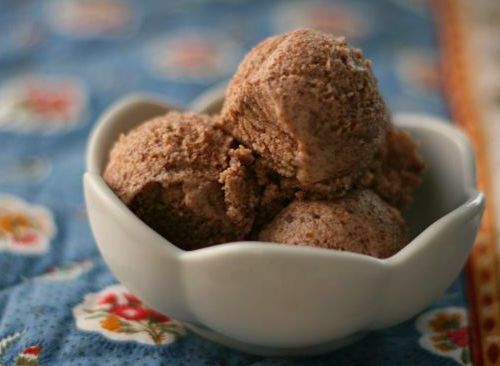 Working full time and two kids makes it difficult to find the time but when I came across this super simple recipe for Nutella Ice Cream on the Chocolate and Zucchini blog I thought this was a keeper. Now I haven't tried it yet but it's next on my list. My daughter is obsessed with Nutella and ice cream too so I have a feeling this one will fly out of our freezer. And with only two ingredients....its not expensive to make and I have a feeling really good! Combine the chocolate hazelnut spread and the evaporated milk in a medium mixing bowl, and stir with a whisk until they become one and nice and smooth. This may take a few minutes. To speed things up, you may use a blender/stick blender/stand mixer, or gently heat the evaporated milk beforehand. If you think its too thick you could loosen it up with a little cream. Cover and refrigerate until well chilled. Whisk again and churn in your ice cream maker.